Looking for a New Nissan Rogue in your area? CarGurus has 1,127 nationwide Nissan Rogue dealers with 218,692 new car listings. Semi-autonomy spruces up the 2018 version of Nissan's popular compact crossover, the Rogue. Without counting pickup trucks, the Nissan Rogue is the second best-selling car in the entire U.S. In 2017, Americans bought more than 403,000 of them (only a few thousand more people chose a Toyota RAV4). This roomy, comfortable, and affordable crossover has a lot going for it, and for 2018, the Rogue offers automated driver assists that rival the best from luxury automakers. Our orange-on-orange test car would have scored an “8,” because its two-tone 19-inch wheels, generous helpings of chrome, and orange-black interior turn an ordinary commuter car into a showpiece. It even inspired me to wear orange sneakers and borrow my editor’s orange jacket during this review. But that’s because our test car is the fully loaded SL Platinum Reserve, which stickers for more than $36,000. Your neighbor’s Rogue isn’t looking so spiffy. The Nissan Rogue is a practical crowd pleaser rather than an enthusiast’s delight. It neither pushes style boundaries nor falls out of fashion. Lower-grade Rogue trims with darker colors, smaller wheels, and plain, all-black cloth interiors are the norm—and they’re nothing to swoon over. Still, the Rogue’s proportions and profile are purposeful. Nissan updated this second-generation Rogue for 2017 with a larger, V-shaped front grille, more aggressive headlights with LED running lights and LED taillights, a new rear bumper, and restyled interior pieces like a flat-bottom steering wheel. The 2018 model is a carryover, save for the infotainment system. The padded leather trim on the center console, armrests, and dash—plus the ribbed stitching on all the seat inserts—is a welcome upscale touch on the SL, though you’ll have to settle for coarser fabric and harder plastic on the more common S and SV trims. You’ll be pleased enough given the S's $24,800 starting price. A single engine and transmission pair with either front- (FWD) or all-wheel drive (AWD) on every trim. 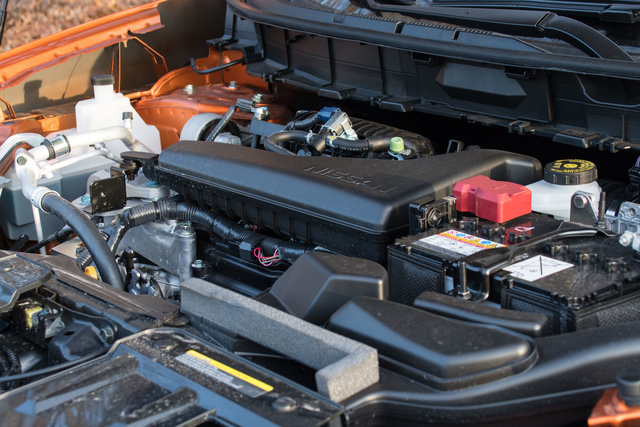 That engine, a 2.5-liter inline 4-cylinder with 170 horsepower and 175 pound-feet of torque, is what sinks the Rogue’s performance rating. It’s weak, loud, and rough. The continuously variable transmission does a decent job extracting everything it can from this powerplant, simulating gear ratios and keeping the revs in the middle range. In Sport mode, off-the-line acceleration improves for the first hundred or so feet, then the car just revs even higher and sounds louder. It’s significantly slower than competitors. The engine’s groan becomes tiring on hills and highway merges. The Rogue is no featherweight—SL versions like ours top 3700 pounds—and driving it quickly is a chore. Nissan needs to fit a turbocharged engine with more low-end torque so the Rogue won’t struggle as much. The benefit of such a low-powered engine is fuel economy. The EPA estimates FWD models at 26 mpg city and 33 highway, with AWD models at 25/32. We averaged 24 mpg in our test. That’s perfectly acceptable in a high-riding crossover that can’t be made as aerodynamic as a small car. 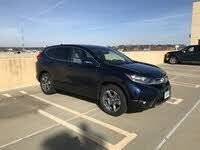 But the Honda CR-V and its turbo 1.5-liter inline four outperforms the Rogue in both acceleration and fuel economy. It also sounds quieter and more refined. So there’s little argument to favor Nissan’s outdated 2.5-liter engine. At everyday cruising speeds, the Rogue achieves a smooth-riding, finger-light comfort that requires little effort. The suspension is soft and well-damped, even on our Rogue’s thin-profile tires. The steering is vague, so that it’s difficult to feel when you’re off the center position. As a result, it requires corrections at higher speeds. Brake pedal feel is squishy. There’s no reason to expect the Rogue to drive like a premium sports car, but a higher degree of poise and control is needed. That’s a feeling essential for safety and driver confidence. The Rogue behaves like a much older vehicle. What the Rogue gives up in performance measures, it gains in passenger accommodations. No matter which seat, the Rogue excels in legroom, headroom, and shoulder room. It’s big inside compared to other compact crossovers. 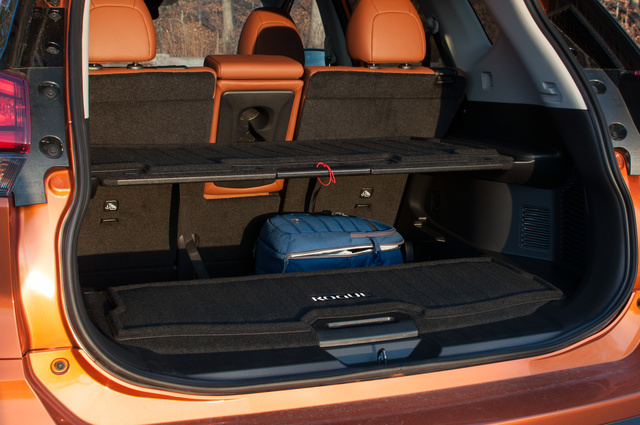 The seat bottoms are shapelier and less flat than those in the BMW X3, which adds to long-distance comfort. Outward visibility to the front, sides, and rear is exemplary, too. The step-in height and door cut-outs are also perfect—no knee-bending, crouching, or bashed noggins. Behind the rear seats, which offer multiple positions to recline, the cargo hold swallows 39.3 cubic feet. Lowering the seats gives 70 cubes. But the real innovation is Nissan’s Divide-N-Hide, a clever use of removable floor panels that can be folded into a covered box. Remove the rearmost cover by pulling it toward you in an upward motion and locking it on the top rails. Then pull the foremost cover and stack it vertically. It takes a few awkward tries to complete in four, fluid motions, but after that it’s simple. You can easily secure loose items or cover valuable property without a bulky, sliding cargo cover (which usually gets in the way when you have taller cargo). Additionally, you can access under-floor space in a pinch without anyone knowing what’s underneath. Controls are well-marked and easy to read, except for several important buttons placed far beyond a driver's normal reach. The heated steering wheel, driving mode, and AWD lock functions are at knee-height when they should be on the center console. 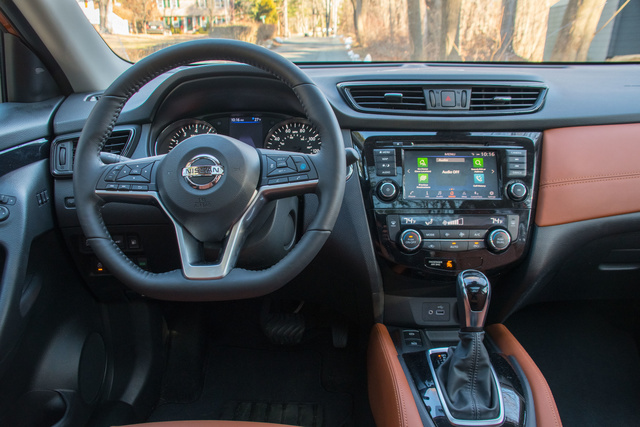 For 2018, Nissan removed several hard buttons on the dash so you can no longer adjust the stereo’s tone or switch sources without diving into the touchscreen. Otherwise, everything is logical, clear, and simple, including the steering-wheel-mounted controls for the 5-inch color instrument panel display. A USB port and auxiliary audio jack are right up front and center, instead of buried in a cubby. With optional remote start, the Rogue can heat the steering wheel and seats automatically (just remember that because the seat heaters use rocker switches, you’ll need to leave them activated when you shut the Rogue off). Just having the ability to remote-start the Rogue in 9-degree winter weather is impressive. That’s the problem with automated technology. ProPilot Assist is good enough to lure you into a false sense of security, and then—when you're changing lanes or for no reason at all—it will oversteer the car and shift it into another lane, or simply fail to steer enough, setting off the lane-departure warning. Around town, the ever-changing lane markings trip up the system. Used on highways with gentle curves or in stop-and-go traffic, it can usually excel for many miles. Use it here and only here. Unfortunately, Nissan fits ProPilot Assist only on the SL equipped with both the Premium and Platinum packages. This means it costs at least $34,000 (or $36,000 for AWD models), which is beyond the budget of most Rogue buyers. But you can’t find this technology in other crossovers. Elsewhere, Nissan redesigned its low-res infotainment system for the 2018 Rogue. The crude, 1990s-style line renderings are gone, replaced by a map that can actually show a road’s curves. 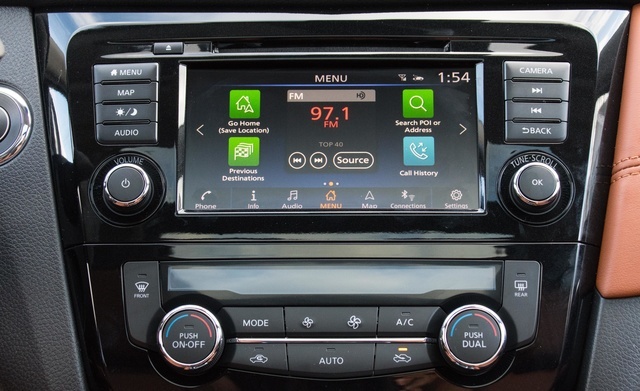 Apple CarPlay and Android Auto are standard, but you’ll like Nissan’s interface as it is. A new customizable home screen places the audio, phone, and navigation controls you want at the center. Swipe left for weather and traffic apps. It’s faster and easier on the eyes when driving. A smartphone app can send walking directions to and from the car, while NissanConnect offers telematics support such as remote unlocking and automatic 911 notifications if the car has been in an accident. The 9-speaker Bose stereo in our car was adequate for a car in this class. 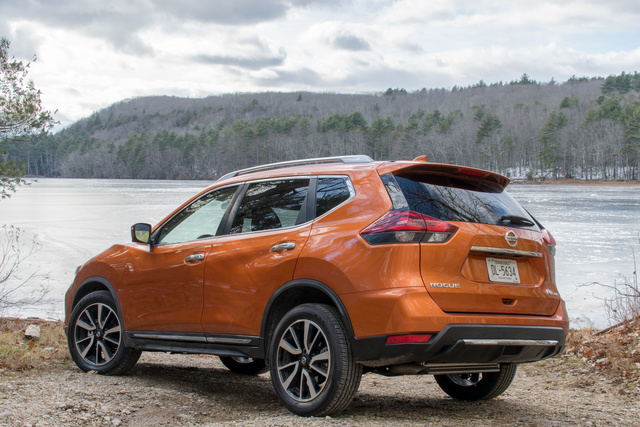 The National Highway Traffic Safety Administration (NHTSA) rates the 2018 Rogue at 4 out of 5 stars. It scored the highest 5 stars for all seat positions in side crash tests, although the front-impact crash tests scored just three stars for the front passenger and four stars for the driver. The Insurance Institute for Highway Safety (IIHS) rates the 2018 Rogue as a Top Safety Pick, giving it the best Good rating in all five crash tests and a Superior rating for its standard auto-braking system. Blind-spot monitoring is also standard. 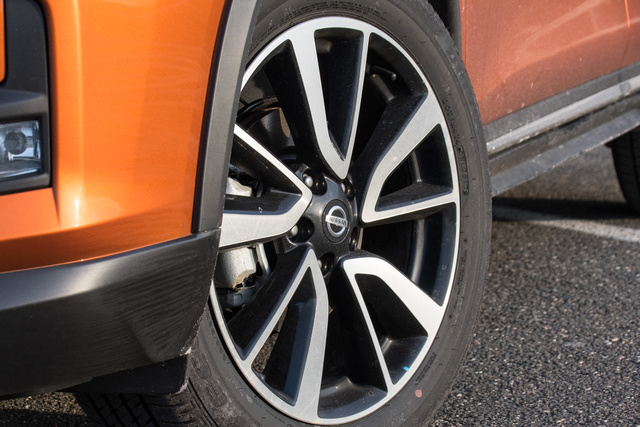 So is Intelligent Trace Control, Nissan’s version of torque-vectoring, which can brake individual wheels to help the driver stay in line around turns. The 360-degree AroundView cameras are available on lower trims. The 2018 Rogue starts at $24,800 for the S, $26,020 for the SV, $27,115 for the Midnight Edition (an SV with a blacked-out look), and $31,180 for an SL. AWD adds $1350 to each trim's cost. Our AWD SL stickered at $36,760 with destination, including every available factory-installed option and the extra Monarch Orange paint. The orange (Nissan calls it tan) leather requires $2860 in options. But that’s for the fanciest Rogue. Most well-equipped AWD SV models are priced under $30,000, which is the sweet spot in this market. If you can get past the undesirable powertrain and mundane dynamics—as 400,000 people a year apparently do—the Rogue’s class-leading technology, comfort, space, and reasonable price make it an ideal crossover. 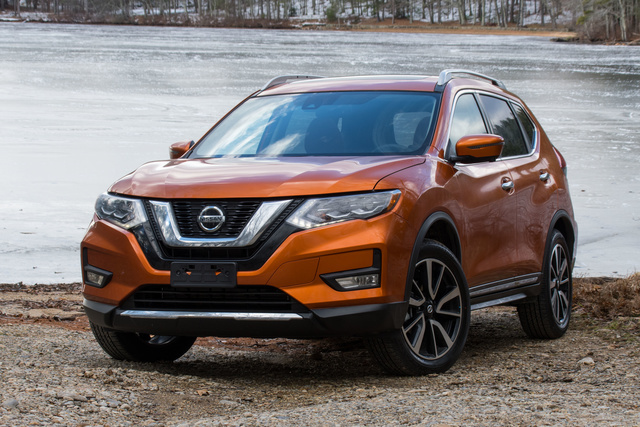 What's your take on the 2018 Nissan Rogue? 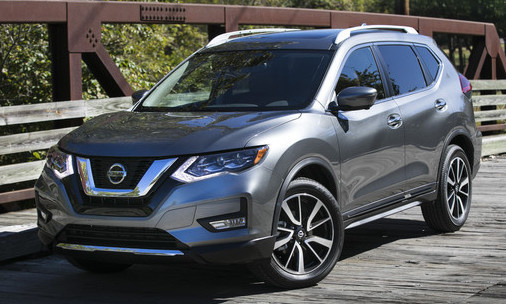 Have you driven a 2018 Nissan Rogue? Enter your zip to see incentives for a new Rogue in your area. Looking for a Used Rogue in your area? 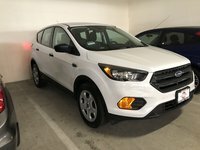 CarGurus has 80,219 nationwide Rogue listings starting at $2,900. My radio screen is blank, my radio still works but the screen only works with my backup cam. What can I do to fix it? ?